The Mausoleum of Genghis Khan (chéng jí sī hán ling 成吉思汗陵) is a national AAAA level scenic area. It is located in Yijin Huoluo Banner (yī jīn huò luò qí 伊金霍洛旗) of Erdos (è ěr duō sī 鄂尔多斯), which is 180 kilometers away to the south of Baotou (bāo tóu 包头). The present mausoleum was built in 1954. Genghis Khan engaged in expedition all his life, and had ever extended the territory of Mongolia to the middle Asia. His mausoleum is grand and the construction is magnificent. The true burial site of Genghis Khan, who was buried in a secret, unmarked tomb according to his will, and all personnel involved in the construction and burial having been killed thereafter, remains a mystery to this day. In 1954, this memorial mausoleum, a cenotaph, was built in traditional Mongolian style in honor of Genghis Khan, even housing an empty coffin. The mausoleum was built to replace the previous system of portable memorial shrines to Genghis Khan, and all the relics and ceremonial objects once spread around are now housed here. Genghis Khan (1162 - 1227) was a famous political and military figure in the Chinese history. With his unmatched talent, he built up his powerful empire reaching as far as Europe. He reunified the chaotic Inner Mongolia prairie and led his people to be a great civilization. He made great contributions to the founding of the powerful Yuan Dynasty (yuán cháo 元朝) (1271 - 1368) and the unification of China which enhanced greatly the interactions of the peoples of China. Due to this great feat, he was named "Genghis Khan" by Mongolian tribes, meaning "powerful king" in Mongolian. Today, Genghis Khan is still worshipped and remembered by his people. Five hundred nomadic families of his clan were picked to stand guard at the mausoleum, who subsequently became the special group to defend the mausoleum of the great warrior for generation after generation. They were subsequently renamed the Dalhut people (dá ěr hù tè rén 达尔扈特人), which means "guards of the sacred mausoleum" in Mongolian. Their leader chosen from the Borjigin clan (bó ěr jì jí tè shì zú 博尔济吉特氏族) was called Jinong (jì nóng 济农) since first Jinong Kamala (kǎ mǎ lā 卡玛拉) was appointed as the King of Jin (jīn 金). They lived on the Kherlen River (kè lǔ lún hé 克鲁伦河) but later moved to Ordos. The name of Ordos was derived from a plural form of the word ordon (palace), which sometimes replaces the ger (yurt) in the designation of the portable mausoleums. The total area of the tomb is over 50, 000 square meters. 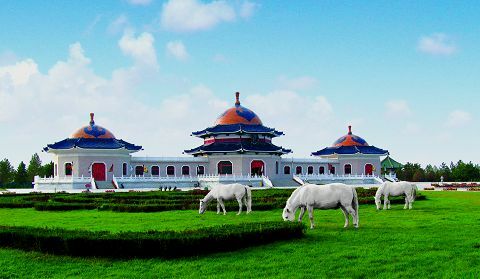 There are such scenic spots as Central Square, Iron Horse and Golden Curtain, Euro-Asian Square, Mongolian Historical and Cultural Museum, Temporary Dwelling Palace of the Han Dynasty. The main structures of the mausoleum are three grand halls, which are shaped like Mongolian yurts, and the corridors which link the three halls. In the middle is the Main Hall, which is also the Memorial Hall. In the center of this stands a white marble statue of Genghis Khan with a height of over 4 meters (around 13 feet). Behind the statue is the map of the vast territory of the Yuan Dynasty. On either side of the Main Hall are the East Hall and the West Hall. In the East Hall, coffins of one of Genghis Khan's wives and his fourth son are laid. In the West Hall, Genghis Khan's arms are exhibited. Along the corridors frescos depict the life of Genghis Khan and the great deeds of his grandson-Kubla Khan (hū bì liè hán 忽必烈汗), who was as great as his grandfather. Every year, there are four sacrifices at the mausoleum. It is on March 21st, May 15th, September 12th and October 3rd of lunar calendar. The sacrifice on March 21st of lunar calendar is held in the main palace. On that day, the local people will come to the sacrifice from all directions. After the grand ceremony, many traditional activities such as horse race, archery and wrestling will be held. Location: on the Gandeli Grassland, Yijin Huoluo Banner, Erdos City, Inner Mongolia (Nèi Měng gǔ yī jīn huò luò qí ě ěr duō sī gān dé lì cǎo yuán 内蒙古鄂尔多斯伊金霍洛旗甘德利草原). How to Get there: Take bus from Baotou Bus Station to Erdos first, then take the sightseeing bus from Erdos square, Dongsheng (dōng shèng 东胜) Hotel, Erdos Hotel or Erdos Railway Station to the mausoleum.